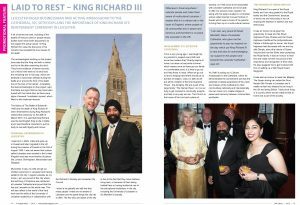 LEICESTER BASED BUSINESSMAN AND ACTING AMBASSADOR TO THE CATHEDRAL, VIC SETHI EXPLAINS THE IMPORTANCE OF KING RICHARD III’S REINTERMENT CEREMONY IN LEICESTER. A lot of stories we read, including of the deaths of famous rulers or people whose bodies have never been discovered, do not explain the actual cause. In King Richard III’s case the discovery of his remains has revealed the true causes of his death. The archaeologists working on the project have said that the King met with a violent end to his life after examining his skull. They found evidence of eleven wounds, out of which nine were to his skull and the remaining two to his body, which are believed to have been inflicted during the battle at or around the time of his death, due to the loss of his helmet. Jo Appleby, the lead archaeologist on the project, said that there are signs that he may have been buried with his hands tied, as there were signs of several “humiliation injuries” which fitted in with historical records. The history of The Battle of Bosworth, 1485 and the death of King Richard III were remembered during King Richard’s reinterment ceremony on the 26th of March 2015. It is said that King Richard was the last English King to die in battle and it was therefore important to put his body to rest with dignity and honour. I was born in Delhi, India and grew up in Kuwait and later migrated to the UK during the invasion of Kuwait on the 2nd of August 1990. I was not aware that a place called Leicester even existed in the United Kingdom and was more familiar of places like London, Birmingham, Manchester and Glasgow. My brother in law, my wife and all our children were born in Leicester and having settled in the city, I regard Leicester as my home. I am very proud of this city where the last King of Yorkshire was reinterred at Leicester Cathedral and proud that this has put Leicester on the world map. This will also reflect to the world of the hard work and the skills of the University of Leicester academics in collaboration with the Richard III Society and Leicester City Council. worship, so I feel proud to be associated with Leicester Cathedral and to be able to offer my services when needed. Vic along with his sisters studied in a Christian school called Carmel Convent School of Kuwait which was a choice of his parents to bring them up in a multi-cultural manner. “I am also very proud of David Monteith, Dean of Leicester Cathedral, who gave me the opportunity to pay my respects on the day which put King Richard III to rest and also for acknowledging my support in this project and towards the Leicester Cathedral,” says Vic. Vic Sethi is acting as a Cultural Ambassador to the Cathedral, where he demonstrates the commitment and has the potential of raising awareness of the vision and mission of the Cathedral to other communities nationally and internationally. His own vision is to create bridges of peace and harmony between communities worldwide. King Richard III is a part of the Royal family and I am very grateful to the Royal family and the Government, because of whom we are here today in the UK enjoying the freedom of speech and true democracy. 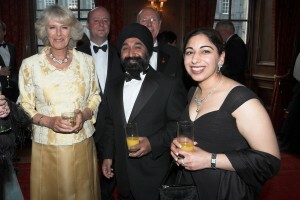 It was an honour to be given the opportunity to meet and His Royal Highness Prince Charles and Her Royal Highness Camilla at the Hollyroodhouse Palace in Edinburgh for dinner, His Royal Highness had discussed with me and my wife Dimple, about the history of Queen Victoria and how the Sikhs were protecting the Royal family. It was an honour to hear this and made me feel very proud of the importance and recognition of their roles. He also assigned me to get involved with him on setting up a Sikh Royal Guard Regiment. It was also an honour to meet Her Majesty The Queen during her visited the Guru Nanak Sikh Temple in Leicester and it made me feel very blessed to be living in the UK and being British. I feel proud living in a country where we are made to feel at home and a part of the society.